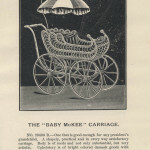 Special Catalogue of Baby Carriages is from 1891. The President of the United States at that time was Benjamin Harrison. His term was from 1889-1893, and there were quite a few family members living with him at the White House. One of these was the Harrisons’ daughter, Mary Harrison McKee, who lived there with her husband, James Robert McKee, and their two children. And, yes, Mary and Robert McKee had a son nicknamed Baby McKee! His name was Benjamin Harrison McKee. He was almost two years old at the time of his grandfather’s inauguration. During the presidential campaign, he received his nickname. Butler Brothers, New York, NY. 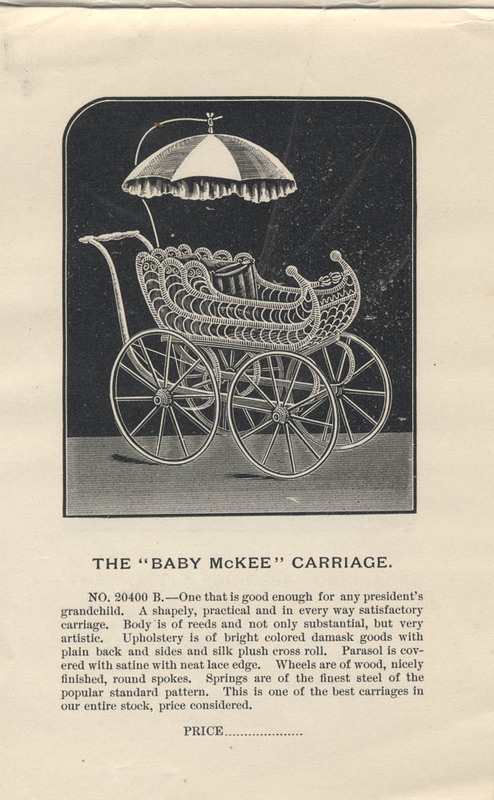 Special Catalogue of Baby Carriages, 1891, “Baby McKee” Carriage. Each of the carriages illustrated in this catalog have a name such as “Little Darling” Carriage, “Sweet Baby’s” Carriage, or “Little Princess” Carriage. There is even a carriage for a first baby, and its name was, of course, “First Baby’s” Carriage. It was described as “the easiest riding carriage possible” and was the highest priced carriage offered by Butler Brothers at the time. Butler Brothers, New York, NY. 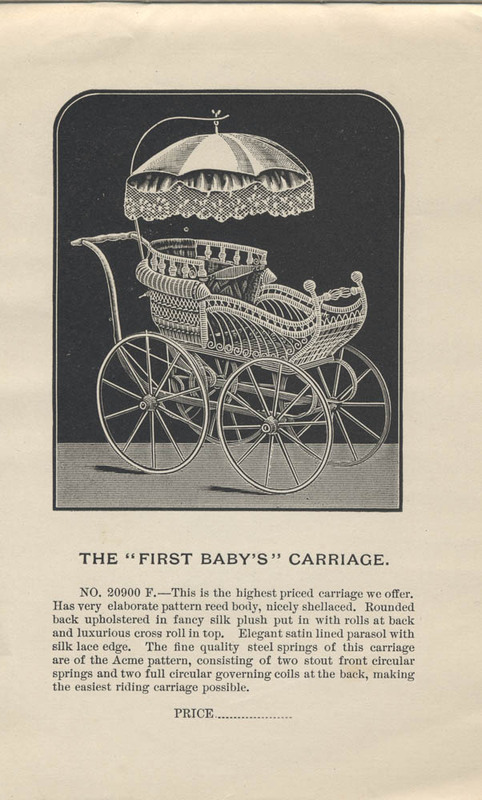 Special Catalogue of Baby Carriages, 1891, “First Baby’s” Carriage. Special Catalogue of Baby Carriages is located in the Trade Literature Collection at the National Museum of American History Library. The Galaxy of Images includes more pages of baby carriages from this catalog. Benjamin Harrison. Wikipedia. Accessed 20 May 2013. Mary Harrison McKee. Wikipedia. Accessed 20 May 2013. Seale, William. The President’s House: A History. Volume one. Washington, DC: White House Historical Association with the cooperation of the National Geographic Society, 1986. Next Post Meet Jackie Chapman! From 1891! This is very interesting, and the description ‘One that is good enough for any president’s grandchild’ definitely makes the carriage stand out to anyone. I would have loved to see what it looked like full colour, but even having the image above is great to see. Thanks for sharing!